More Connections to Sera Myu in Minky Momo Musical! Two actors involved with Sera Myu have just been confirmed to be a part of the 30th anniversary Minky Momo musical! 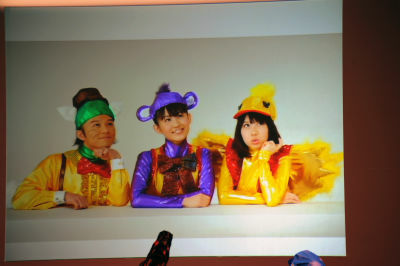 Yoshiya Yukimura (many characters from 2000-2004) and Takayo Ooyama (Sailor Neptune 2004-2005) will be starring as Mocha the Monkey (middle) and Pipil the Bird (right) in the musical. The two of them starred in only one musical together, and we wonder if they spent any time reminiscing about Sera Myu in rehearsals. Along with Sindbook the dog, the three of these animals serve as Minky Momo’s companions. And to remind you, the show is produced by Toshiyuki Takezawa, who produced the Sera Myu musicals and also worked as a producer on PGSM. Yoshiya and Takayo were revealed at a special performance and talk show that took place at the Tokyo Anime Fair on March 28th. They were not there, but images were shown. The other big piece of news about this series at the TAF? There’s a new anime series in the works! Perhaps this is something we can look forward to from Sailor Moon in another ten years? A New Movie for Mikako Tabe! Way back in January, it was announced that popular manga title Kimi ni Todoke was going to get a live action movie adaptation. KnT is a shojo romance about a girl named Sawako who unfortunately earns the nickname Sadako because of her resemblance to the character of the same name from the popular movie, The Ring. Everyone at school thinks that Sawako can also speak to the dead and see ghosts. Sawako feels so alone, until she meets the very popular Kazehaya, and the two of them fall in love. 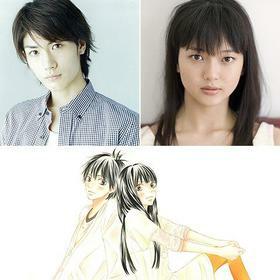 Mikako Tabe (Yaten Kou/Sailor Star Healer) will be playing the role of Sawako, alongside the very popular Haruma Miura as Kazehaya. The film is set to open on September 25th in Japan. Fumina Hara Appears with Salaryman! On April 8th, NHK began to rebroadcast season 5 of the popular Japanese sketch comedy show, Salaryman Neo. Fumina Hara (Sailor Moon from 1998-1999) appears on the show, and also appeared at a promotional event at the NHK Broadcast Center on March 30th. Here she is posing with the rest of the cast – don’t you hear her saying “I am the business-suited pretty soldier of love and justice, formerly known as Sailor Moon!” At the event, NHK revealed that there is going to be an addition to this rebroadcast – each episode will have a new short story. It makes mention of a skit where Aki Nakada dresses up like a member of the Takarazuka Revue, and played her role very convincingly. Tae Kimura Gets Fashionable and Controls Men in New Movie (and has a new book too)! 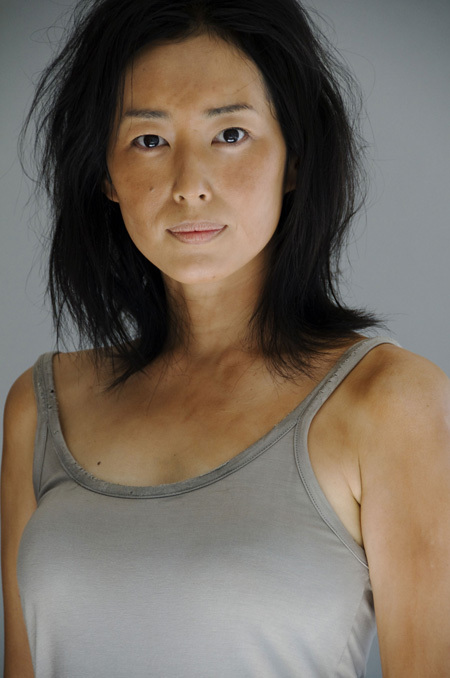 Tae Kimura (Fisheye) has a leading role in the upcoming movie Tokyo-Jima (Toyko Island). She plays Kiyoko, a 43-year-old housewife that suddenly finds herself in an icky situation when she is the only woman of 24 people stranded on an uninhabited island. Her character is tough, and she uses her charms as well as her body to control the men of the island. Even with all of the accolades that Tae has received in the last few years, this must be a challenging role for her to play! In the movie, she cooks for everyone and even caught a sea snake. She told everyone at a recent promotional event that she didn’t worry, because she likes snakes! Tae thinks that the women in the audience will sympathize but isn’t sure what the men in the audience will think. She hopes that everyone will wonder just what they are at the end of the movie. This movie also has a nice bit of a Haute Couture edge to it – French Luxury brand Hermes is the brand of choice for many of the cast members, and is featured prominently. Kiyoko wraps herself in a Hermes scarf during the movie. Japanese women who want the same scarf can purchase it in Hermes stores in Japan for the “affordable” price of ¥48300 (just shy of $520 USD). Fans can check out the R-rated Trailer at the official site (don’t watch it if you are under 18). Tae also just released a new book of essays about her life as an actress, a daughter, a wife, a mother, and other personas. Entitled Kakato (Translation: Heel), these essays highlight many of her ups and downs in life from her career to her family. She isn’t much of a computer user, but really used it a lot to put this book together, staying up all night in hotel rooms just to get her thoughts written out. But, that isn’t to say that she didn’t write anything in longhand – in fact just to get the right meanings for the words, for some of her essays she wrote them out first. Despite her hardships, she knows that acting is her dream job and she is happy to be an actress, even though she is known as a very emotional and dramatic actress in Japan. As far as the title goes, there’s a very interesting reason why she chose it. It is a symbol of a part of the body that is often neglected to people, so she thinks. We kind of understand it since she feels that she has to show a lot of herself to the public and is always on her feet, never really having the time to lie down and reflect on life. This book is available from Kodansha and costs ¥1350 (or $14 USD). Yuu Shirota to Dub Voice of Popular Dorama! IRIS aired from last October to December in South Korea (information in English here), and was a huge hit. So much so, that TBS decided to purchase the dorama for broadcast. IRIS is about best friends Hyun Joon Kim and Seung Hee Choi, who are brought in to work for the NSS, an intelligence organization. The two of them fall in love, but things take a wicked turn when Hyun is sent to Hungary for a solo mission, and he learns that Vick, an assassin from a top secret spy organization known as IRIS, is looking for him. As this mysterious and unpredictable series progresses, Hyun Joon learns what IRIS is. This show has shot episodes all over the world, including the United States, China, Japan, and Russia! 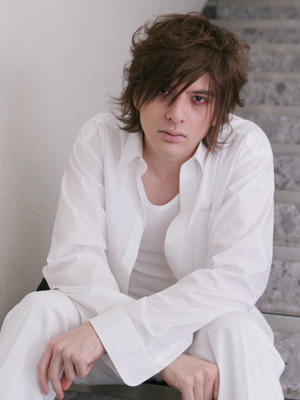 Yuu Shirota (Tuxedo Kamen from 2003-2004), will be dubbing the voice of Hyun Joon Kim in Japanese. IRIS will start on TBS on April 21st, and run for approximately 6 months. This show has been renewed for a second season in South Korea, however the actor that plays Hyun Joon Kim (Lee Byung Hun) is unable to return to his role. Yuu was also featured in another article about singer Jin Akanishi, who just announced that he will be playing two concerts in LA this June. Everyone knows that Jin and Yuu are best friends, but did you know that Yuu considers Jin to be like an older brother to him? The rest of the article goes into other friends of Jin and how they have been caught partying by the tabloids. Kousei Amano Starts Nightclub Tour! 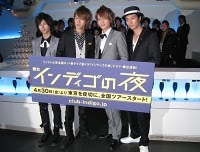 Hot on the heels of the success of Tough Times at Club Indigo, Kousei Amano (Tuxedo Mask in 1999) is joining some cast members in a special night club tour of 22 Japanese cities to promote the show. They are going to also serve as the club hosts! 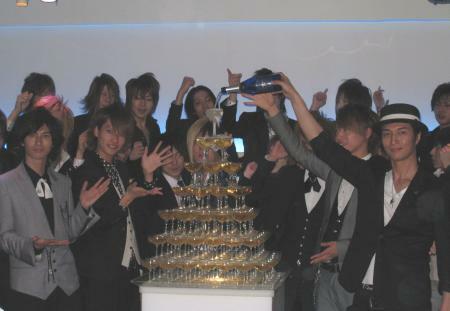 The first of these party dates happened on March 31st at the Shinjuku Kabukicho Host Club called Club Acqua. By the way, if you are trying to spot him in the photo, he is second from the right in the gray suit. 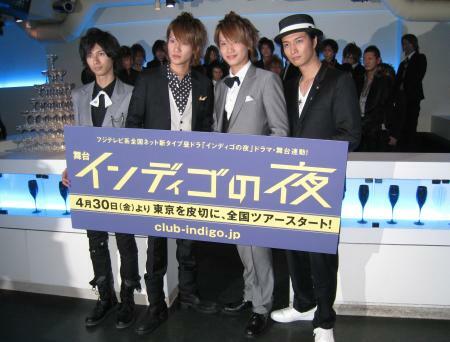 The boys of the Indigo Club sure looked sharp that night, as they partied with clubgoers and poured champagne. Kousei was quoted, saying that he only hopes that he can work hard to please everyone at these 22 cities, and that he understands how hard these hosts have to work to please everyone at the club. 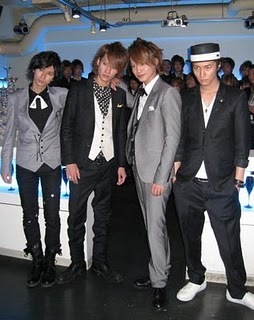 Here’s one last picture for all you fangirls to see these “dream hosts”. Maki Aizawa Represents the Typical Resident of Niigata Prefecture in Japanese Variety Show! ). This show aims to find out what makes the residents of each prefecture in Japan different from one another by looking at these local customs and attitudes in depth. On April 22nd, Maki Aizawa (Loof Merrow in 2004), appeared on the show representing Niigata prefecture. We couldn’t find any more about Maki’s involvement in the show, but did learn a little bit about the episode’s features. There is a new way to enjoy Soba in Toshigi, every February 1st, the people of Aomori look forward to a day of bargain sales, and in Sapporo, the 1972 Olympics inspired a large part of their population to take up the Bobsled! To learn even more about the show and the products seen, visit the other official site of the show here. And for our Anza Ooyama (Sailor Moon from 1993-1998) fans, she is currently touring in Brazil with her band Head Phones President. Head to SOSMP BR for more, including a video of her band performing a moving, acoustic version of their hit song “Chain”!